The humorous propaganda maps stirred nationalistic fervour, mocked and belittled enemies and even served as a tool for students to learn their geography. Editor - Stakheev Vladimir, photos - Archive, music - Jean Louis Hargous "Ritournelle"
Beginning in 1870, maps that featured regional stereotypes, animals, symbolic imagery, and mythical and historic figures associated with particular countries became a popular way to express prejudices, humour and political commentary. 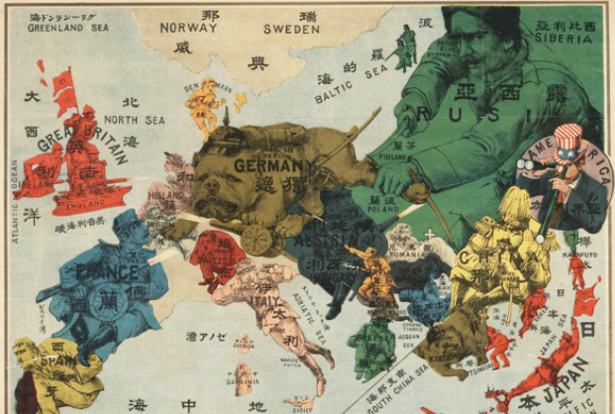 The rise of the serio-comic map caricature genre reached its peak of popularity at the beginning of World War I. In many of the maps above it is seen that the more distorted or grotesque depictions are saved for the least favoured nations while the home side is of course rendered as normal or heroic. The style declined in popularity as the war dragged on and film and posters became the more dominant media of propaganda.